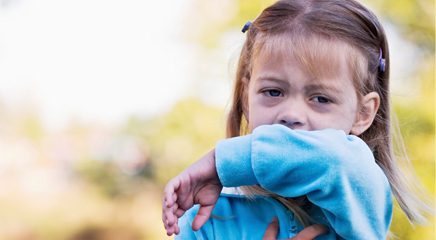 The first randomized controlled study on the effects of prednisolone treatment at the first acute, moderate-to-severe, rhinovirus-induced wheezing episode in young children has found short-term benefits, but no long-term benefits in preventing recurrent wheezing. Seventy-four patients ages 3–23 months with a confirmed rhinovirus diagnosis were randomized to receive oral prednisolone (first dose of 2mg/kg, followed by 2mg/kg/day in two divided doses for three days) or placebo. After a 12-month follow-up, the children in the prednisolone group had less cough, rhinitis, noisy breathing, severe breathing difficulties, and nocturnal respiratory symptoms at home within two weeks post-treatment but no long-term outcome differences were seen between the two groups. Children with >7000 rhinovirus copies/mL had a reduced risk of physician-confirmed recurrence within two and 12 months vs. placebo; the authors state that prednisolone could be beneficial to this subgroup for preventing recurrent wheezing, but not as a routine recommendation for all young children with a first acute, moderate-to-severe, rhinovirus-induced wheezing episode. Background: Rhinovirus-induced wheezing is an important risk factor for recurrent wheezing. There are no randomized controlled trials on the effect of systemic corticosteroids in patients with this disease. Objective: We sought to study the short- and long-term effects of prednisolone treatment of the first acute, moderate-to-severe, rhinovirus-induced wheezing episode in young children.